Indulge your patrons with the rich, creamy flavor of dark chocolate blended into their coffees and specialty drinks with this Torani 64 oz. sugar free dark chocolate flavoring sauce! Packaged in a user-friendly 64 oz. plastic squeeze bottle, it's sweetened with Splenda brand sweetener, which offers the taste of real sugar without the calories. Featuring a thicker consistency than liquid flavoring syrup, this flavoring sauce is great for swirling atop whipped cream or blending into sweet frappes. It adds just the right amount of decadent dark chocolate flavor to any cup of freshly-brewed coffee. You can even use it to top ice cream, cheesecakes, and other homemade desserts. This sugar free Torani sauce will be the perfect, finishing touch to any beverage or dish, and is sure to keep all of your guests coming back for more! Pour ingredients over ice and blend. Garnish with whipped cream and a drizzle of Torani Dark Chocolate Sauce, if desired. Pour ingredients over ice and blend. Garnish with whipped cream and a drizzle of Torani Sauces, if desired. Does it get any better that this! Sugar free dark chocolate! I am 100 percent in. The chocolate flavor is still very good you would think thats is light since its sugar free but its not. Customers consider us to have the best hot chocolate locally, especially since most other places uses a sweetened chocolate. The chocolate taste comes through without tasting like most other "sugar free" products. For the amount of uses we get per bottle, the price is also a plus. Great sugar free chocolate sauce. Perfect for lattes or ice cream. It pours well and you can’t tell it’s sugar free. The price is great for the size also. A great tasting sugar free dark chocolate sauce that is amazing and has a wonderful texture. The sauce is great on our ice cream and over fresh fruit. 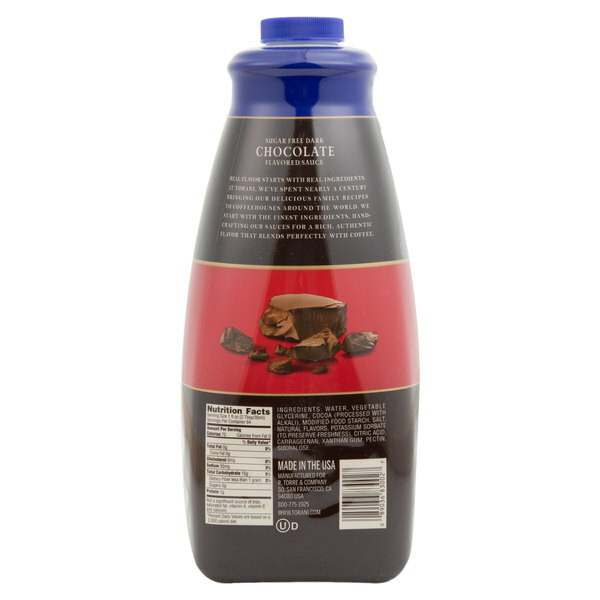 The sugar free dark chocolate flavoring sauce is rich and creamy. A great sauce for topping ice cream and other desserts. Very tasty and super creamy. Out of all of the flavoring sauces we probably use this one the least but it's a nice option to have for sugar free customers. This sugar free dark chocolate sauce is perfect for those customers who love chocolate! We use it primarily for espresso drinks and all of our customers say they can't even tell that it is sugar free. This sugar free dark chocolate is great to use in mochas and hot chocolates for customers who are wanting less sugar in their favorite drinks. We own an ice cream shop and a lot of our customers ask if we have any sugar free flavoring sauces for their ice cream. That is why we carry all kinds of sugar free sauces. It is just as good as the one that is not sugar free. The sugar free dark chocolate flavoring sauce is really great for my cooking. A sugar free alternative is great for myself because of my sugar. I love the great quality and taste of this sauce. This sauce makes the best hot chocolates ever. We also use it for several of our lattes. But the kids love the taste. We add just a touch of white chocolate for sweetness. Nice sugar free flavoring without any unpleasant after taste that can sometimes come from sugar free products. Personally, I don't see what makes this a "dark" chocolate sauce, but it has good chocolatey flavor. My grandmother loves her chocolate sauce but became a diabetic a few years ago. I bought her this to drizzle over her strawberries. She loves the taste and says its the best chocolate sauce she has every tasted. A good product. it is economical and we enjoy it daily. doesn't get clumpy and dry around opening. this is available quickly and at a good price. This is by far the best sugar free chocolate sauce I have ever tried. It has the same consistency as regular sauce and has no after taste. I use it to make sugar free coffee frappes along with some Torani sugar free flavoring syrup, coffee and cream. It is delicious! The Hershey's brand is a bit better, but if you're looking to save some money this is perfect. You really can't tell any difference in mixed drinks, but your wallet will feel it! You will notice a difference if you're not used to sugar free items but it is still very chocolatey tasting and much lower in calories. Good option to have, we go through a lot. 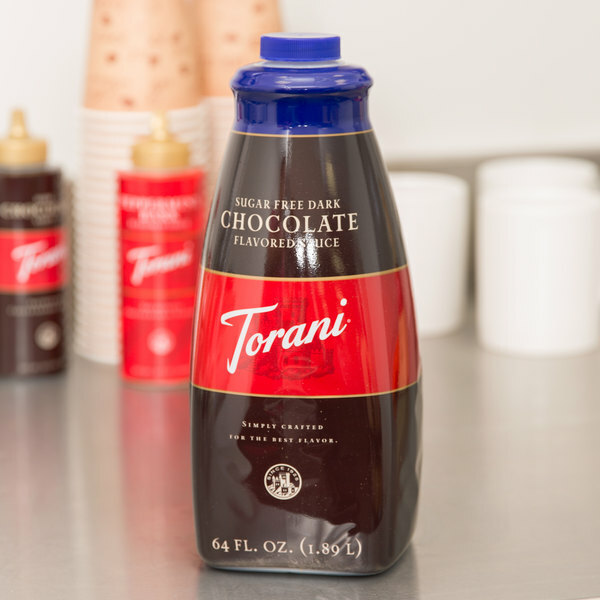 We really wish that Torani would make a milk chocolate regular and sugar-free sauce, as we have never seen them have it. However, the SF dark chocolate is an wonderful addition to our collection of sauces. It provides a nice relief of sugar packed goodness! I LOVE CHOCOLATE...and I love being responsible with my calories! 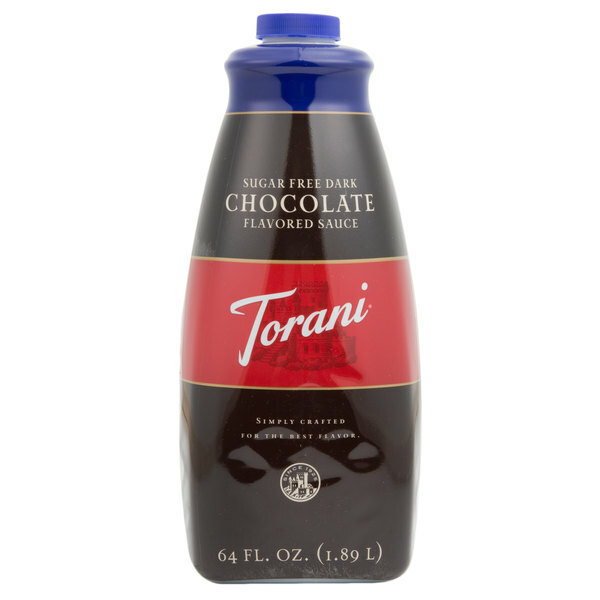 This 64 oz Sugar Free Dark Chocolate from Torani is a great substitute for the calories! This is one of the best chocolate sauces I've tried. The flavor is mellower and has more depth than any other we've used. Highly recommended. This stuff is incredible! A true rich, thick gourmet chocolate sauce or syrup. Texture is thick and wonderful, like a true chocolate fountain. And the dark chocolate taste is perfect. Take it from a dark chocolate choco-holic, this is sublime. Everyone who's tried it loves it. Torani sugar free chocolate is a great addition to coffee drinks and tastes like regular chocolate. customers will love it and not be concerned with the sugar. Great as an addition to other flavors or simply on it's own. I am a fitness professional so I use sugar free products to enjoy a "cheat" snack or dessert that won't spike my insulin levels like sugar does and promote fat storage. The Torani Sugar Free Dark Chocolate Sauce can only be described as decadent - as close to the real thing as sugar free can get with a rich chocolate flavor. However for my purposes it is too high in calories and carbs to use on a regular basis, so I enjoy it only on occasion. It adds a new dimension of flavor and richness to my chocolate protein shakes and coffee beverages. I make sugar free light ice cream in my gelato maker and this chocolate sauce is the perfect topping. It is also amazing drizzled over sliced bananas or strawberries!